The University of Santo Tomas Publishing House (USTPH) will hold two book-signing events of its top authors on Sept. 16 at the 39th Manila International Book Fair at the SMX Convention Center, Mall of Asia complex, Pasay City. 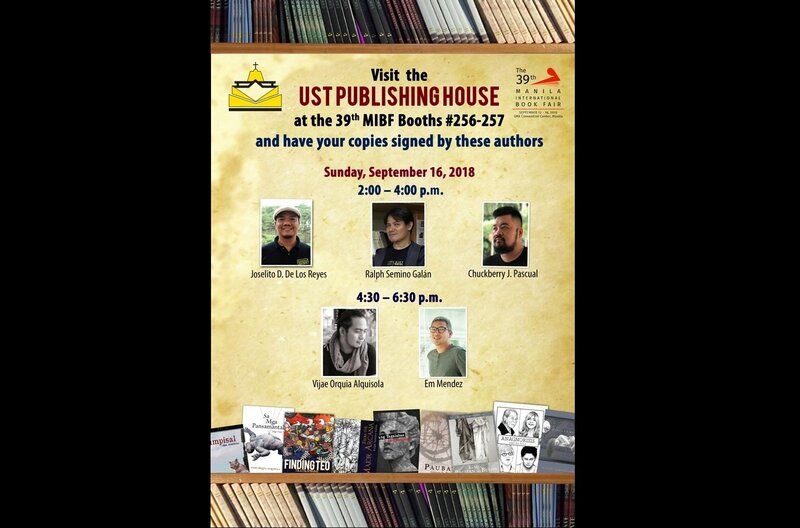 At the USTPH booth at 2-4 p.m., best-selling authors Joselito de los Reyes, Chuckberry Pascual and Ralph Galan will sign copies of their latest titles: “Finding Teo: Tula at Talambuhay,” “Ang Tagalabas sa Panitikan” and “Sa Mga Pagitan ng Buhay at Iba pang Pagtutulay,” respectively. “Finding Teo” is De los Reyes’ critical biography of well-loved Filipino poet Teo Antonio, while “Tagalabas” is Pascual’s latest book of critical essays. “Pagitan” is Galan’s translations of English poems into Filipino and vice versa. All three authors are resident fellows of the UST Center of Creative Writing and Literary Studies (CCWLS). De los Reyes is also chair of the UST Department of Literature; Pascual is coordinator of the new AB Creative Writing program of the UST Faculty of Arts and Letters; and Galan is deputy director of the CCWLS. Afterward, at 4:30 p.m. also at the USTPH booth, authors Vijae Alquisola and Em Mendoz will also be holding a book-autograph session. Event is open to students, creative writers, literary enthusiasts, and the general public.